Finally, finally, after living in Scotland for approximately 11 months and 12 days, Mike wore a kilt! And he looked mighty good in it, if I say so myself. 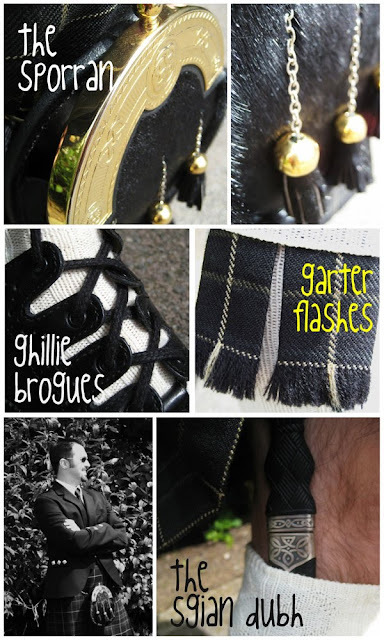 He had to basically assemble his kilt attire, which involves several specific accessories. We had fun with a little photoshoot outside our flat before we took off for the wedding! The layout of a Scottish wedding is a tad different than your typical American Big Day. The "first round" of guests are invited to the ceremony, cocktails and a sit-down dinner. Then a "second round" of guests are invited to join the official reception. It's an interesting break-up of the usual free-flowing format in the US, but the dance floor, the music and the fun are all very much the same! But then you've got a gorgeous granite cathedral and kilt-clad gents, which are not-so-subtle reminders that we were clearly in Scotland for the newlywed's special day. What did Mike carry inside his sporran (which is Gaelic for purse, by the way)? Let's see... there was a cell phone, a flask and some money. Everything you need! The photographer snapped a couple cool photos of all the guys who wore kilts to the wedding, standing behind the bride. Neat, huh? Here we are with the groom! Congrats to the happy couple! And thanks for our true Scottish wedding experience! I have been waiting for this!!! GREAT post and a GREAT way to end your year in Scotland! Best wishes to the bride and groom!